418 Gallery reached its 9th year of activity in April 2017. Created by the German – Romanian art historian Joana Grevers and the American businessman Guy K. Williamson, the gallery portfolio has represented artists from different generations, from great young artists in their full ascension to icon figures of the New Avant-garde from the 60s and the 70s of the past century. The two different directions that are being followed mark the principles of the local and international contemporary art scene and, on the occasion of this anniversary, we want to review 9 of the most active artists in our gallery events all along these years. Anca Bodea (b. 1982), painter based in Cluj-Napoca, Ştefan Radu Creţu (b. 1983), Kinetic art author based in Sibiu, Petrică Ştefan (b. 1988), abstract painter based in Timişoara, Cristian Răduţă (b. 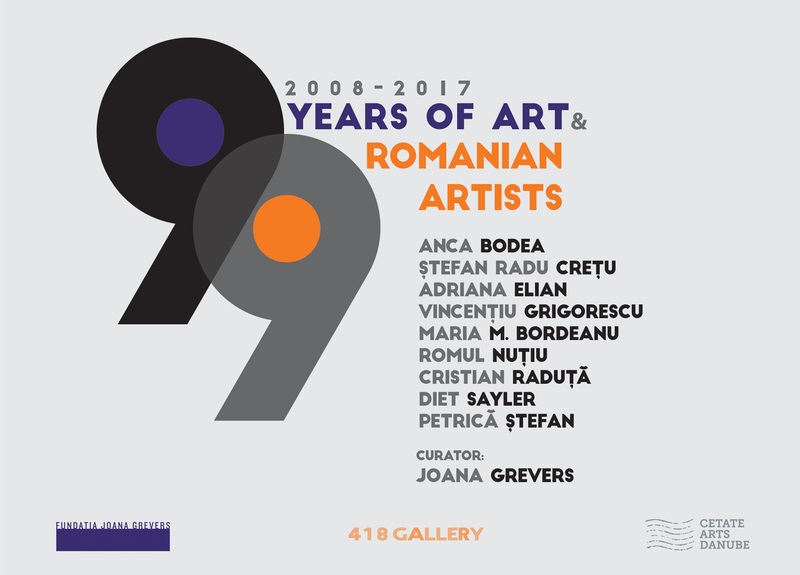 1982), sculptor and Maria Manea Bordeanu (n. 1982), painter, both based in Bucharest, are five young artists who permanently collaborated with the gallery in its first nine years of existence. Specific collaborations happened as well, with various artists such as Roman Cotoşman, Sorel Etrog, Adriana Elian, Liviu Russu, Aurel Vlad, Alexandru Niculescu, Dumitru Gorzo, Cristian Sida, in group or solo shows between 2008-2016. The core of the gallery’s portofolio consists of three international artists, representatives of the European Abstraction from the second half of the 20th century. We are talking about Vincenţiu Grigorescu (1923-2012), Romul Nuţiu (1932-2012) and Diet Sayler (n. 1939). Together with Joana Grevers Foundation, 418 Gallery sustains Cetate Arts Danube annual residencies and is also involved in numerous international projects.